There are some things I find difficult to appreciate in a properly dialectical fashion; one of these is Emeryville. A small city effectively carved out of the north-west corner of Oakland, it was once one of the most heavily industrialized parts of the Bay Area. 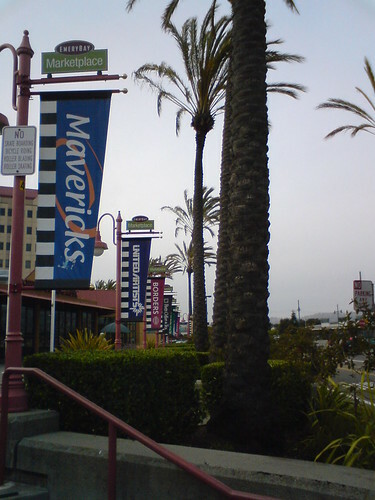 Following an earthquake in 1989, it was redeveloped as a city-sized shopping mall. As such, it’s one of the most extraordinary attempts I am aware of to destroy public space. It’s unbelievably hostile to pedestrians, as walking from shop to shop requires crossing the gigantic car parks the city is built around, or navigating the eerily deserted bridges over the railway, or squeezing through the fences that separate one piece of corporate turf from another. Advertising hangs like heraldic banners, turning the public spaces of the city into the fortified encampments of different brands. 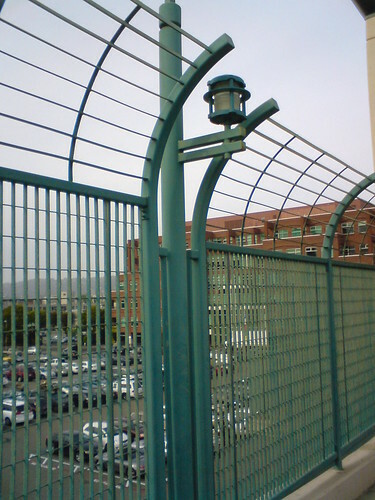 A potential dialectical key to Emeryville lies in the train station; which was the city’s original reason for existing, and, being seriously damaged by the 1989 earthquake, was also a major catalyst for the redevelopment of the city. But the aesthetics (to say nothing of the political economy) of America railways are interesting. 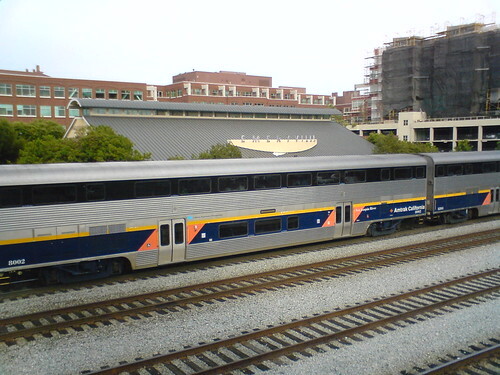 The 1950s styling of the Amtrak’s rolling stock is picked up to the point of parody by the design of Emeryville station. But it’s a parody that’s rater too appropriate to Emeryville, the town rebuilt as a shopping mall. The shopping mall is the dream image of the 1950s, the dream image post-New Deal prosperity. 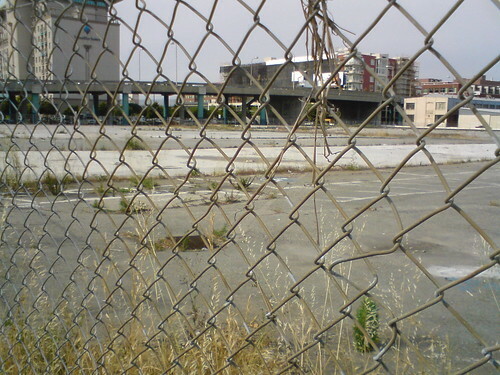 Part of the horror of Emeryville is seeing that dream made flesh, while still, here and there, haunted by a post-War optimism. Walking back to the bus stop, over the bridge across the train lines, I saw this problem crystalized in industrial design. The lamp above, kitsch nostalgia as part of late-capitalist security culture.